Gundog Essentials DVD is a great tool in training the “ready-to-hunt” retriever. Developed by Evan Graham who has over 30 years dog training experience. The DVD offers graphically illustrated explanations geared directly for the trainer. • What Should I Do With my Puppy? 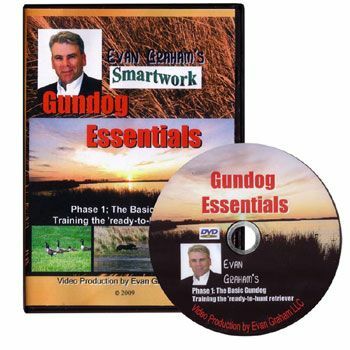 The new In the Field DVD moves forward from our original Gundog Essentials, and provides clear, easy to follow instructions, tools, tips, and tricks to put all basic and advanced skills to work. Multiple marks and blind retrieves; land and water, plus much more….